NEW! 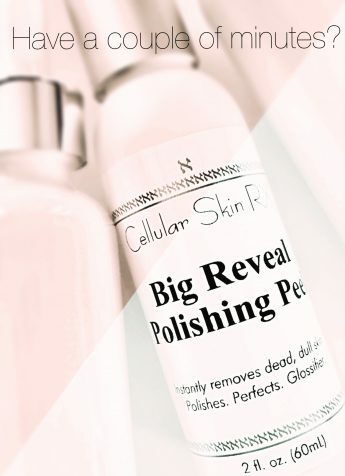 Big Reveal Polishing Peel is here. Have a couple of minutes to spare? Want super-smooth, glossy, polished skin? Look to the newest addition to the Cellular Skin RX product line-up to get you the results you want. In less than two minutes, this fruit-enzyme-based, active glycolic/lactic acid peel will instantly remove dead, dull, pore-clogging skin cells revealing a brighter, smoother, younger looking complexion. Over time, wrinkles are softened and imperfections erased. Skin looks glossy and fresh – ready for serums, moisturizers and the perfect selfie! 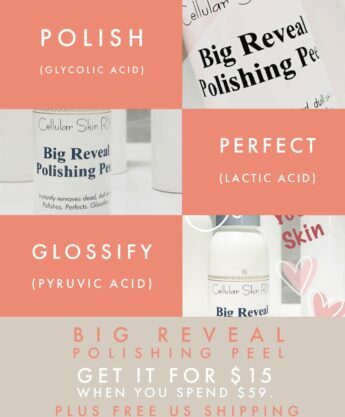 Spend $59 and get polished, perfected and peeled for just $15 Use Coupon Code Peel15 at checkout!